WASHINGTON--(BUSINESS WIRE)--With spring’s arrival, now is the time to think about ways to protect gardens and landscapes from dangerous invasive pests. To recognize April as Invasive Plant Pest and Disease Awareness Month, USDA-APHIS (Animal and Plant Health Inspection Service) encourages the public to follow six simple tips to protect their properties from 19 particularly destructive invasive species known as Hungry Pests, which are primarily spread by humans in the things they move and pack. Start by only buying plants and seeds from reputable sources, such as established nurseries or online businesses. Ask where they buy their plants and if they comply with federal quarantine restrictions. Fly-by-night dealers, whether in your neighborhood or online, may not be doing what is required to keep plants free of invasive pests. Call your local USDA office to find out how to safely dispose of trees, branches or other yard debris. Moving such materials to areas outside your property could spread invasive pests. Make sure any contractors you are working with also follow these procedures. For a list of local USDA offices, visit http://www.aphis.usda.gov/planthealth/sphd. Don’t move citrus plants or items made with fresh citrus, such as floral arrangements or kaffir lime leaves. That’s how citrus greening – a citrus disease that is killing America’s orange groves – has spread. You may live in an area under quarantine for an invasive pest. Call your local USDA office to find out before moving homegrown produce, plants and plant parts. And to be safe, don’t bring back plants from other areas, including when traveling abroad. That’s how the Mexican fruit fly – which threatens at least 50 types of fruits and vegetables – entered the United States. Look for round and D-shaped holes in trees, especially in the late spring and summer months. They could be the exit holes of Asian longhorned beetles or emerald ash borers. Also look for yellow, thin or wilted leaves, shoots growing from roots or tree trunks, sawdust-like material on the ground or in branches, and unusual woodpecker activity. If you see something that looks suspicious, be safe and report it using the “Report a Pest” button found on the home page of the Hungry Pests website. 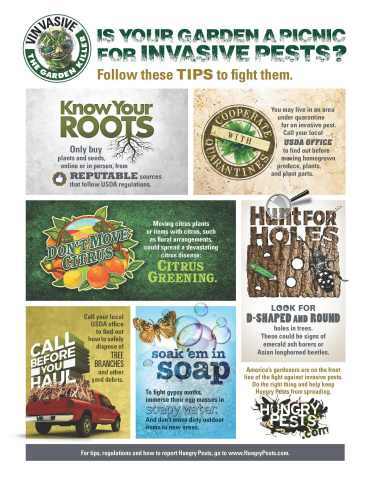 To learn about other ways to protect your property from invasive pests, visit www.HungryPests.com or join the conversation on Facebook or Twitter. 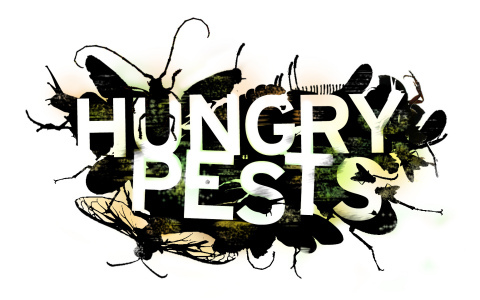 The website includes photos and descriptions of the 19 Hungry Pests, an online tracker of federal quarantines by state, and phone numbers to report signs of invasive pests. The Animal and Plant Health Inspection Service is a multifaceted federal agency with a broad mission area that includes protecting and promoting U.S. agricultural health, regulating genetically engineered organisms, administering the Animal Welfare Act and carrying out wildlife damage management activities. These efforts support the overall mission of USDA, which is to protect and promote food, agriculture, natural resources and related issues. To learn more about APHIS, visit www.aphis.usda.gov.